Who says beauty is in the eyes of the beholder, when everyone can be beautiful with few fixes. If you stopped laughing or smiling with your lips wide open, it is probably due to crowded or crooked teeth. Orthodontic treatment (Braces) will help you in bringing back that confidence to smile and laugh again. This treatment straightens the teeth or moves them into a better position. This improves your aesthetic appeal and also aids in the way the teeth bite together. Also, braces are not just for people with crooked teeth. If the teeth are improperly aligned, braces help in alignment. You can better clean between the teeth, preventing decay, gum disease and of course, to improve the overall appeal. If you notice any of these signs mentioned below in your child or yourself, visit JP Dental Clinic for consultation with our Orthodontist. 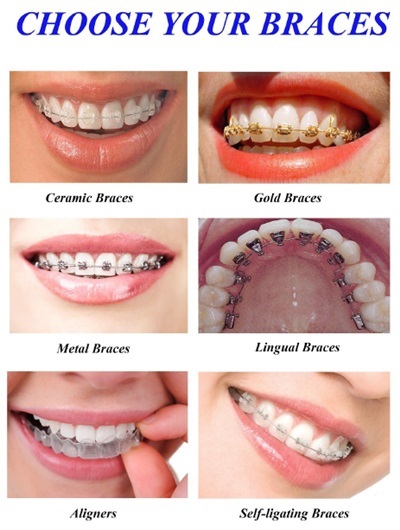 Metal Braces --These are traditional braces most often seen in children and teenagers. Metal braces are the most affordable and use a system of brackets and wires to move the teeth over time. Ceramic Braces--These braces work like traditional metal braces, except that the brackets bonded to the teeth are made of ceramic. This helps prevent staining, and they can also be color-matched to blend with the teeth. Lingual Braces--Lingual braces, sometimes called “braces behind the teeth,” are a common alternative to traditional braces. Like traditional braces, they are used by an orthodontist to help realign and straighten teeth. The difference is that the braces are glued to the backs of your teeth instead of the front, making them less noticeable. Self-Ligating braces--Self-Ligating Braces come either in traditional metal, ceramic or clear brackets and are made from the same materials as traditional braces. These type of braces deliver quick results and don’t have to visit your Orthodontist frequently. Self-ligating braces eliminate the need for bands and that makes it different from standard braces. Aligner is an orthodontic appliance system used to treat crooked and crowded teeth in adults and teens. Aligner trays that are worn at all times with the exception of during meals and when brushing or flossing. The trays are custom fitted to the teeth, making them virtually unnoticeable when, talking, laughing and eating with other people. Patients will receive a sequence of trays, each of which is slightly different than the one before. The aligners provide a slight resistance to the teeth, forcing them to move into alignment over time. With the help of Aligner, adults and teens can achieve the smiles they’ve always wanted without feeling self-conscious about the mode of treatment. Aligners fits well into busy adult schedules, as there is no need to attend frequent visits for wire tightening. Most patients has to wear new aligner tray every couple of weeks.